We partied on the Three Sisters islands until we actually died, The Beastie Boys would have been proud. Abdul the Butcher would however not have been all that impressed, and so we need to have another go there. Thrown in a cell to be executed again, this time we got Lucky and one of my pirate pals managed to find a loose bar which we managed to work free. Oddly our motley crue had been left armed and so we were able to slay the unsuspecting villagers quite easily in a group battle (7/6). Not satisfied, the village was torched whilst the women and children fled inland. Sadly though, no actual loot was to be found, another situation we’d come through with no reward. Remaining within the Three Sisters region, we set out to explore the volcanic-looking island. We landed on a sandy shore on the edge of some dense jungle foliage, and a short walk along the beach later and it was all going a bit Island of the Lizard King. Much like our long-lost Mungo (nvr4get), we lost some crew here without the chance to fight back. Rising up from the sand a big crab-thing grabbed a few men who were whisked up and carried off into the sea, costing me 2 Crew Strength points. And some beloved companions, I suppose. I ushered the landing party inland to ensure their safety. My captain skills clearly need some work though as I ushered them inland to be greeted by ‘the ugliest looking critter you have ever seen’ with ‘hundreds of tree-trunk like legs supporting a body as twice as long as the Banshee, while its head – which is mostly mouth – is stacked with knives for teeth‘. Sorry lads, my bad. I include a quoted description though as for such an amazing sounding beast, we are left without an illustration. 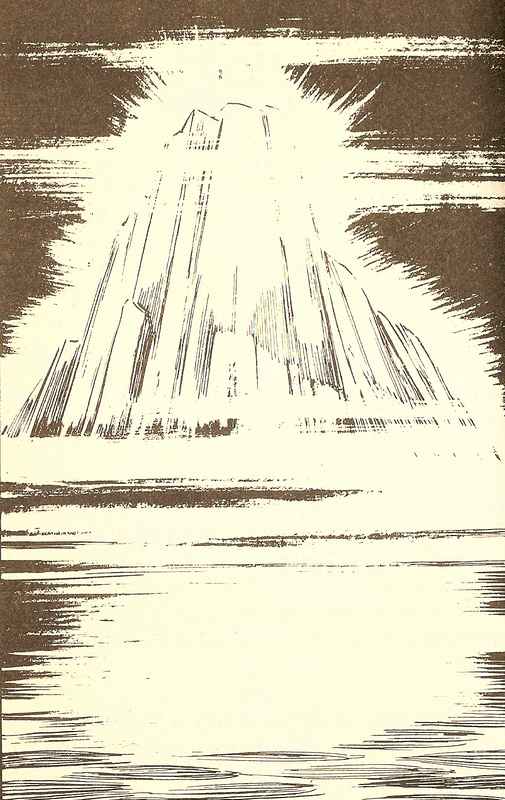 I suppose we might have missed out on that dynamite iceberg picture though if we got this one, so best not complain too much I suppose? Eh? We’d best fight the bloody thing then. 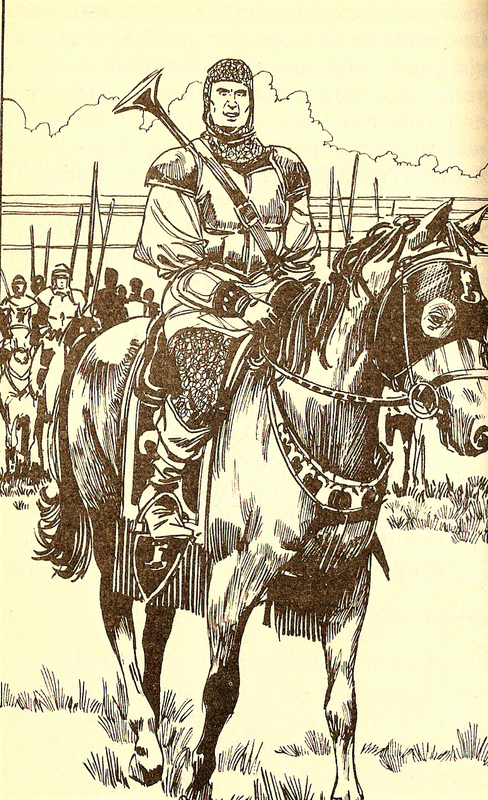 ‘The beast rears its head and opens its mouth in the sharpest grin ever seen by man or god’, and the text enquires if we had found the Crossbow of Axillon on our journey, which as we have barely found anything at all, let alone mystical weaponry, meant we would have to do this the hard way. Our foes name was ‘The Horror’ and was a tough one with stats of 12/12, but thankfully our crew was still very strong despite being nibbled on by crabs and after a big fight where we lost many good men, we finally took down this most legendary beast. And our reward? Nothing. No messing around now boys, we’re sucking at pirate so far. 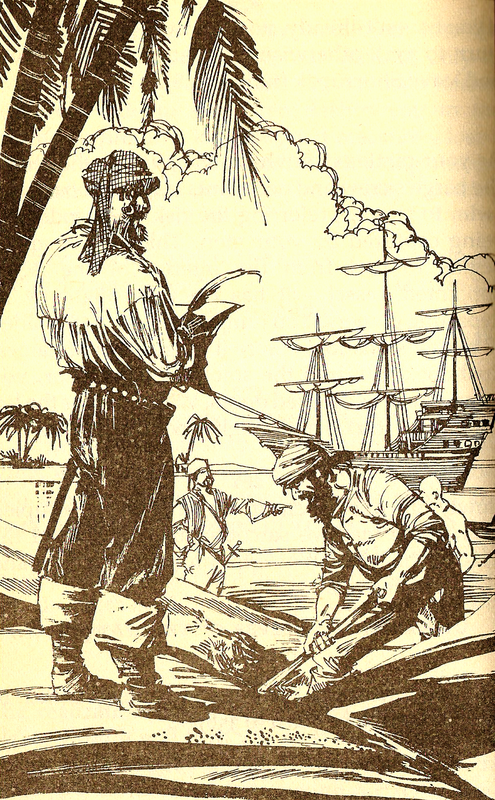 We bulldozed these losers and took their stash for ourselves, 112 gold to add to our haul and we were done with the palm-covered island. Nippur was practically on the horizon now, it was one final slog away and I had to test my Crew Strength against a 3D6 roll. Unfortunately, coming right off the bat of having had a few big fights, my crew was absolutely buggered and I failed. The winds picked up and Nippur wasn’t where we expected it to be… my crew had sailed us off-course somehow and we had missed our deadline. My adventure was over! So, let’s say we hadn’t just fought the most ferocious god mouth of knife-teeth that ever lived and we managed to pass that Crew Strength test, this time we actually did have Nippur on the horizon and were on the home stretch. Curiously, the text asked if I had the Bag of Four Winds. Why, yes! An item I actually had! Oh and what’s that? Did I give the crew 100g to not mess around with them? Well… no, I shouted at them instead like a proper captain would. Rewarding my strong leadership, my loyal crew snuck into my cabin and took those wind bags, opening them up hoping to find some spoils for themselves. What they actually achieved was to create a storm so ferocious it raged for three whole weeks and carried the ship all the way back to Tak. Nice work, morons – my adventure was again over. So, let’s say we hadn’t just fought the most ferocious god mouth of knife-teeth that ever lived and we managed to pass that Crew Strength test AND we’d coughed up 100g to my ungrateful, scumbag crew… let’s try and progress shall we? Sailing into the port of Nippur my scumbag crew were overjoyed to have made it, I was certain there was still time for four or five more insta-fails at least before we finished, but we had cruised in with (I think) 34 days clocked up at sea. A little odd that we didn’t think to make use of the two weeks plus we had left before the wager was over… Regardless, Abdul was supposedly already here and waiting for us on top of the mountain peak of Nippur, but this interior of the island was entirely walled off. Exploration of this wall led us to a break flanked by huge statues from which hung the bodies of dead sailors, inexplicably a wizened old man in a black robe stated that to access the mountain we would have to defeat ‘the keeper’. Couldn’t we have just agreed to meet Abdul in the pub? Agreeing to the fight I was stripped of my sword and introduced to my opponent who I would have to tackle one-on-one, bare-handed. I was slightly alarmed by this one. What followed was a form of non-standard combat where I was given three choices (punch it’s nose, slap it’s face, whack it in the crotch…etc) and my choice could result in one or both of us losing Stamina. This would continue until one of us was dead, the Keeper having 16 Stamina, I (if I can decipher my notes correctly) had 14. There’s one out-and-out winner and rather than waste time with a speech I’ll get on with the job of announcing the winner who, today, has come first in this competition to see who the winner is in the king of the pirates competition that we have all come to today wondering who indeed will it be, who wins the prize of king of the pirates? And it wasn’t even close. I’d needed at least 800 gold to beat his total, I was evidently one of the worst pirates in the cove. I had been hopelessly trounced. Long live King Abdul. My adventure really was now over. Instead of allowing worms to eat my brain and goodness knows what else, I left the corpses below the Rocs nest well alone this time and carried on down the tunnel to see if I could find my way back to the ship. Given the fact I’d just taken quite a beating from a giant bird, I could use a rest. Sadly, I wouldn’t be allowed to have a sit down and a biscuit just yet as something had just grabbed me by the neck. Swiping out with my sword I connected and heard a squeal, and although I couldn’t see anything, I was in combat with an Invisible Stalker. I’ll forgive the absence of an illustration for this foe. Due to the invisible nature of my opponent, for the duration of this fight I had to deduct my Skill by 2. It wasn’t that strong though at 7/6, and I managed to kill it, or at least make it run away, but still took a couple of hits. I had two clear options for progressing, edging along a ledge which climbed upwards along the side of the cavern or a set of rough-hewn steps carved out of the rock, leading down. Descending the stairs for some time I began to see light at the bottom, not from the sun though, but from four Troglodytes carrying a heavy looking chest through the gloom. An opportunistic boulder lay by the steps and doing some simple 2+2=4 maths, I prised that boulder into rolling down the stairs and crushing the Troglodytes against the stairs. Within the chest they carried was exactly 100 gold which I struggled to carry through a side-entrance to the caverns out into the forests of Roc. As luck would have it I bumped into a few of my crew members who were out scouring the island for me and was taken back to the Banshee for a triumphant welcome. One option for my next destination involved me visiting something called the Dead City, so I obviously decided that was where I would be heading. Four days later, we arrived at the Kish Delta that led up towards the Dead City, we sailed up the mouth of one of the delta rivers at night. A Luck test at this point was failed though and we managed to hit a sand-bar, became stranded and were soon captured by Kishian soldiers from a nearby garrison. I didn’t realise we were even doing anything wrong, let alone that I wouldn’t get the chance to fight back if I was! My adventure was over! So let’s say we passed that Luck test shall we? Good stuff! Lucky old me, passing the Luck test. 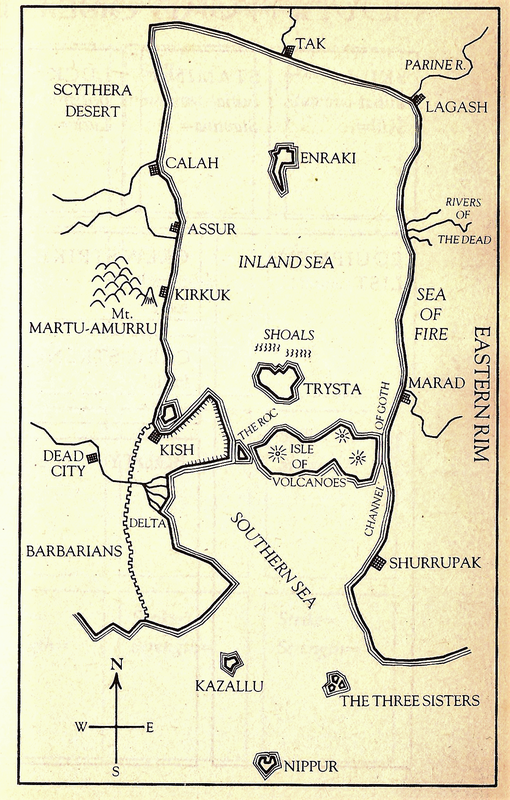 It didn’t seem that I could actually get any further though, the river passed between walls of the city of Kish and a huge chain ran across the water, preventing any ships from getting past. Given my last experience with these people I decided to cut my losses and turn around back to sea. That was both fun and an excellent use of my time. We head South! Five days later, heading south of Shurrupak, towards Nippur, a supernatural freezing fog began to settle around the ship and before us floated a huge mountain of ice. We were lucky enough not to collide with any of the floating icebergs, but it looked like somebody else hadn’t done quite so well as a fairly large galleon was stuck stranded on the ice ahead. Approaching to see what salvage we could grab we disembarked and climbed through the ice towards the wrecked ship, a valley in the ice blocked our progress and so we moved up around the sides. As luck might have it though, we were not the only ones here looking for our pound of flesh. Now that’s more like it! A ferocious looking Ice Beast (9/10) was scavenging on the bodies of the ships crew and was able to take a sizeable 10 Stamina off me before I could kill it. Disappointingly, there was no stash of gold hidden that I could find, but I did manage to discover a jeweled ring, inscribed on one side was a riddle, ‘Where in Albion would you find that which lies between above and below?’. And on the other side was presumably the answer, ‘At the end, next to yourself’. Cool. Supplies were running low and we’d need to find more if we were to reach Nippur, ignoring the islands of Kazallu, I wanted to go and check out the Three Sisters islands, possibly because it reminded me of the wonderful Sunless Sea. After four days the islands came into view and we could identify the nature of the three islands, one volcanic, one palm-covered and one simply described as being ‘neat’. The neat looking island was so called due to the neatly tended fields and huts that we could see, so that seemed like a good place to go to get food. The natives there seemed very happy to see us, god knows why, but they did. Inviting us into their primitive village an evening of exuberant partying commenced, food and drink-a-plenty, we eventually all collapsed from exhaustion. Then things went a little bit ‘Hostel’ as we awoke in a cage. As a result of another failed Luck test that is where we stayed. The village elders came to speak to us, we learned that the island was sacred to its people and that nobody who had seen it could be allowed to live. Bowmen approached the cage and my crew and I were all shot dead where we lay. My adventure was, again, over. The city of Tak is the greatest den of thieves, pirates and cut-throats that the civilized world has ever seen! In this city of scum, there are two pirates infamous for their ruthless greed, their daring raids and their countless skirmishes with death. One of these villains is Abdul the Butcher. The other is YOU. Only one of you can be King of the Pirates. A wager is laid, a race is on. But which of you will win? Out of Granite bay in Tak we set off on the good ship ‘Banshee’, our opponent Abdul’s ‘Haveldar’ cutting through the water beside us, the game was on and I needed to collect a massive haul of booty within the next 50 days or not be considered the greatest pirate ever. At least within the area designated in this map anyway, no other pirates were invited to this competition so I apologise if they are reading. I had fear of no man or crew, getting personal stats of 10/22/12 and crew stats of 12/18, so feeling good about my chances of showing up this Abdul character to be the fool that he is I set about making my first choice of who I would be rinsing for all that they own. Trying to be clever I opted to set out for the mountainous isle of Enraki, ignoring the rich port of Lagash and the desert caravan routes. They just seemed too obvious to me. Four days later I was coasting off the northernmost tip of the island which I now knew was the home to the warrior priests of Asswr sel Dablo. Thankfully, these fearsome holymen were very rich. A direct assault on their fortress seemed like a fairly dumb option, so I aimed to work my pirate cunning and throw in a little deception to try and gain access to their wealth. An unoccupied cove provided cover for the Banshee and I left my crew similarly hidden as I went up to the fortress posing as an emissary from the port of Lagash. Without any effort on my part this was all accepted and I was granted entry and an audience with the abbot. 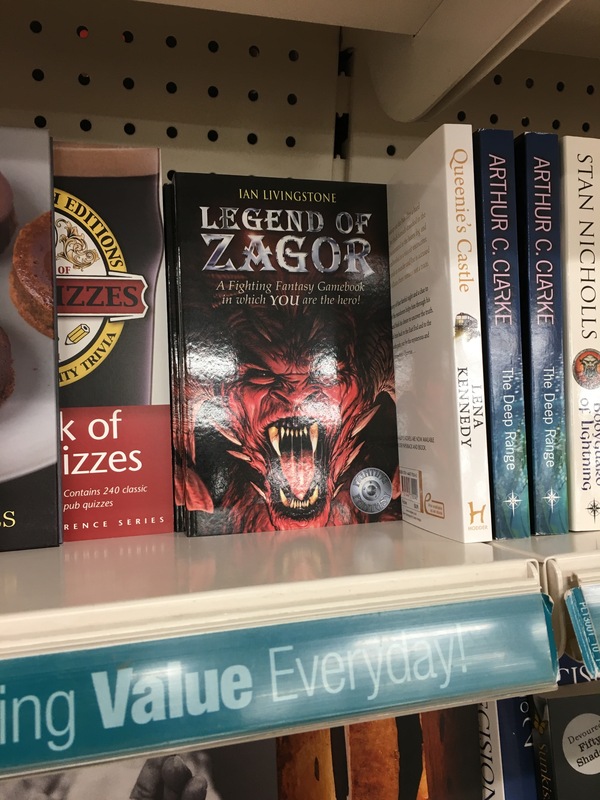 I came with word of an ‘impending attack’ from Lagash, but for a small fee I might be able to misdirect any potential assailants… snigger. Thankfully, if only for the credibility of the story, the abbot didn’t believe a word and dismissed me as an opportunist, having one of his monks open up a Mr. Burns-style trap-door beneath my feet, sending me falling into a pit for the cost of 2 Stamina. My way out was apparently through one of four doors, marked individually with a star-burst, a wheel, an upside-down triangle and a horizontal crescent. Deciding to have a go at the star-burst door was a bad idea, on turning the handle, large metal spikes were thrust through the door, impaling me on the opposite wall and killing me instantly. My adventure was very much over. Is that my quickest fail yet?? So let’s try that again shall we, the horizontal crescent door was my next pick and was an instant upgrade on the previous experience as I wasn’t immediately murdered. 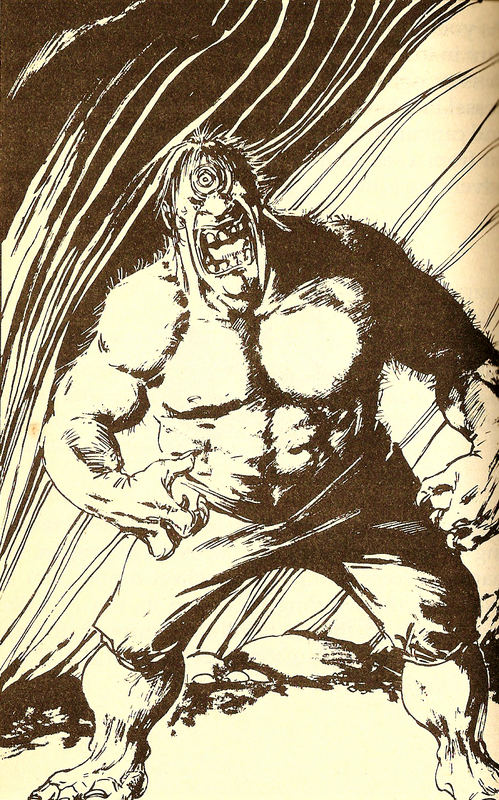 However, looming through the dark behind through the doorway were two large eyes considering me with ‘carnivorous rage’, some very expressive eyes I gather. These eyes then came out from the dark to consider me more carefully in the pit and showed themselves to belong to a gigantic beast, horns sprouting from its head and down its scaly back and tail (not really horns then). What a great opportunity for an illustration, huh? Well tough, because there isn’t one. Anyway, presented with the option of taking evasive action I decided not to fight this thing and pulled off some Legolas moves by grabbing its horns and leaping off its head, success without a single Skill or Luck test needed. This pirate stuff is easy. Having climbed out of the pit though, there were still some warrior priests to worry about. Drawing my scimitar quickly I killed the monk before he had time to react, leaving me to fight the 10/8 abbot who fell without landing any hits at all. Searching the chamber brought me a chest containing 110 gold and a very fine scimitar made of Marad steel which would add 2 Skill, but not while my current Skill matched my Initial Skill. And in a move Skyrim would applaud, another hidden trap-door would lead me straight back out of the fortress to my ship and an exit from Enraki Island. I decided that for my next move I’d be a little more direct and actively seek out some vulnerable shipping channels for some delicious loot to swipe. Predictably, four days later and we were still looking across a flat, monotonous, empty horizon. But things soon changed when a passed Luck test saw us sail upon some floating driftwood that, full of teeth marks, appeared to be the wreckage of a vessel with less Luck than we have. Amongst the remains, a few barrels of booze were fished out and onto the deck of the Banshee for my crew to enjoy, although as they had yet to do anything useful, the 2 Crew Strength it restored were wasted. Chalk up another four days of sailing south and a storm was brewing off the Shoals of Trysta, but Luck remained with us and we ploughed straight through it without any harm to ship or crew and went through to the island of Trysta itself. A day later we landed and on disembarking a collection of well-tended, but apparently unsupervised fields welcomed us. The cows within these fields made my crew suggest we take a few for our ships provisions, but I decided to hold fire until we knew just whose cows they were. Heading out cross-country, we at last found some of the island’s occupants in the form of a heavily armed cavalry who sent out a herald to address us. And yes, I’m not being lazy, this is the first illustration I’ve come across. 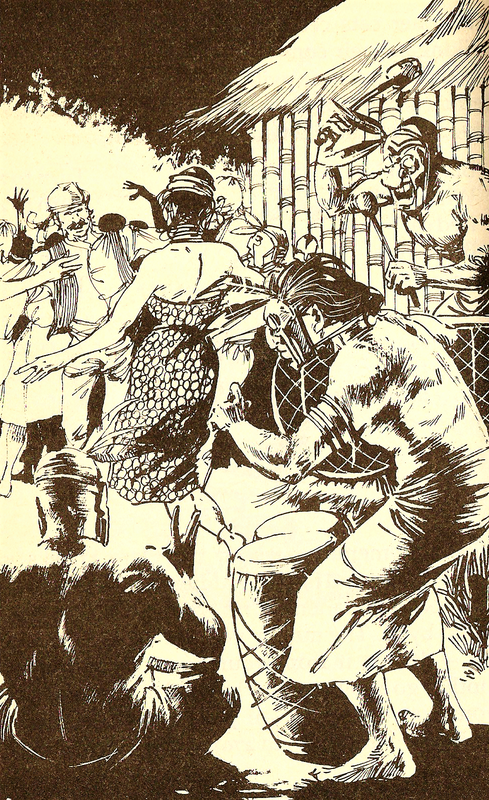 Oddly enough for a group of heavily armed warriors encountering a group of pirates sneaking across their land, they were remarkably friendly, ‘Adventurers, know that you are in the land of the King of the Four Winds and that His Majesty requests the pleasure of your company at his table’. How did he know we were here? Regardless, we set off to have dinner with the king. His castle was full of revelrie and whilst my crew indulged in wine and song, I took a seat next to king at the banquet table where through the course of our conversation I decided to be honest with him about who I was and how was in the middle of an all-in-good-fun pirate competition. He was actually very understanding of my predicament as Abdul had passed through these very halls a few days before. Perhaps that’s why the kings men were waiting for us? He had granted Abdul sacks containing the east and west winds and so felt it only fair he send me away with the north and south winds, also contained in sacks. None of which really makes sense, but I went with it anyway, he told us to open the bag containing the north wind on our way to Nippur and the west wind bag to return. 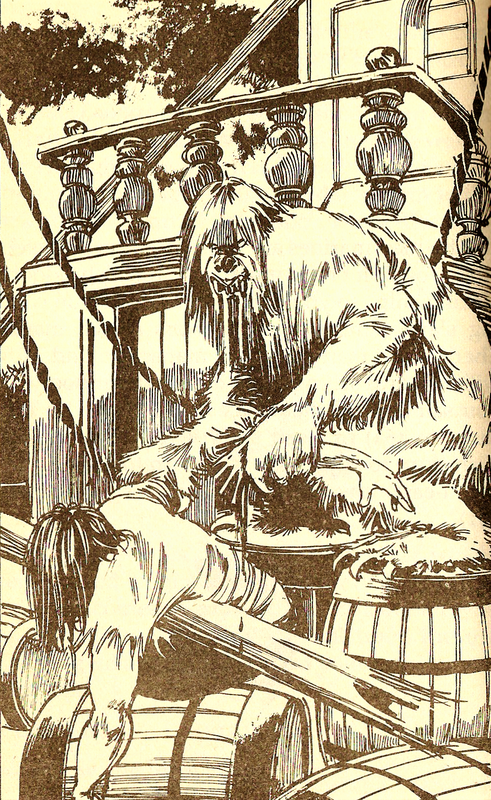 Leaving with full bellies, my crew became very interested in the sacks, thinking they be full of treasure, things were on the verge of turning nasty so rather than bribe them to keep their noses out I simply gave the scurvy dogs a volley of verbal abuse and they backed down. I’d found only 110g so far and wasn’t about to turn it over to these likely drunk idiots! The book then told me the actual point of these wind-bags and that was the manipulation of days spent travelling, standard checks were periodically being made against my Crew Strength (3D6) and these wind-bags would allow me to deduct 4 from the score in order to reduce the time spent travelling. Two days of sailing south-west brought us to the Roc, an island formed by a mountain jutting out of the sea, rising up into the clouds, and so named due to the large species of bird that inhabit it. The text wasn’t lying either as one failed Luck test later and one of the things had swooped down at the ship and flown off with me in its talons. Typical. Fighting my way free seemed like a risky decision to do whilst in flight, but I went for it anyway against a very strong opponent (11/10) who managed to take me down to 12 Stamina – quite a blow given that the only way to heal in the absence of provisions was the 1 Stamina recovered per day of travel. Combat was a waste of time though as she safely dropped me into her nest alongside three large eggs. In the bottom of the nest however was a small hole which led into a tunnel which would form my escape route. In the tunnel I came across the mutilated bodies of a half dozen or so men, presumably old victims of the Roc. A chance for finding valuables was how I saw it and looked a bit closer. Unfortunately this didn’t reveal a huge jewel or a gleaming bag of gold, just worms, brain-eating worms, brain-eating worms that burst from the flesh of the dead bodies in my general direction. I was not wearing the Helmet of Ut-Napishtim as the text enquired and so the worms ate into my brain, reducing my body to a shell within minutes and filling my carcass with eggs ready to leap into the brain of the next person foolish enough to not wear a Helmet of Ut-Napishtim. Can you imagine being the kind of fool that wouldn’t wear one of those! Boy is my face red! But also, more importantly, my adventure was over. The city of Tak is the greatest den of thieves, pirates and cut-throats that the civilized world has ever seen! It’s been well over a year that I’ve had this one on the shelf, arriving at the same time as the last book I covered, Rings of Kether. It marks the final book in the trilogy of titles we received from Andrew Chapman, which can only be a good thing. 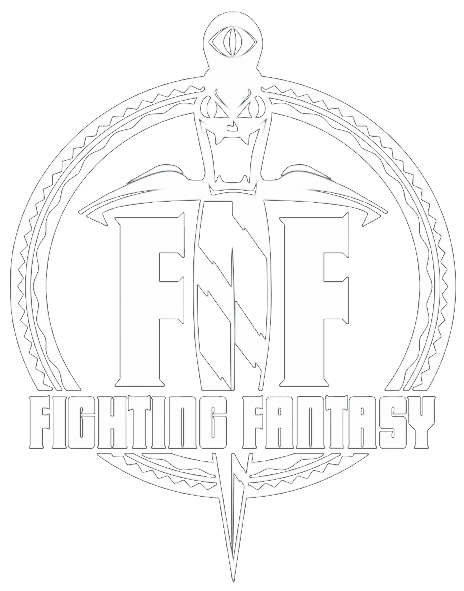 I will certainly go into this one with a positive attitude though as it is at least set in the traditionally more successful fantasy setting as opposed to a Sci-Fi theme. 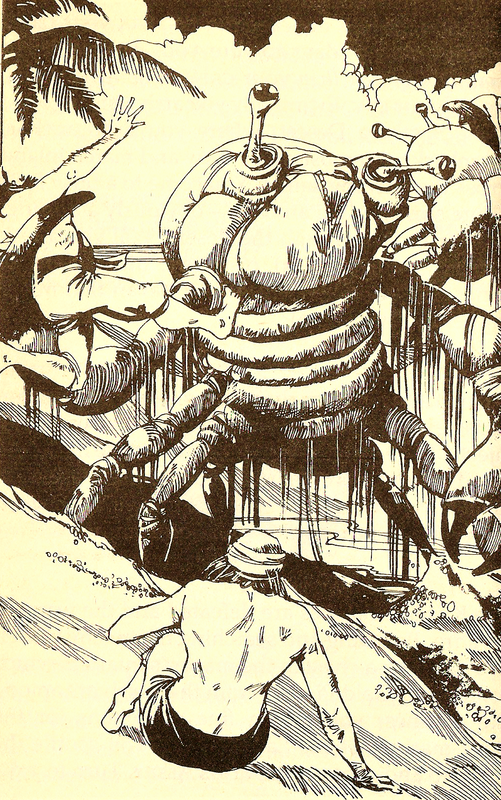 The utterly dreadful illustrations of Rings of Kether are not an issue either as Bob Harvey who did some great work in Talisman of Death is on board here. 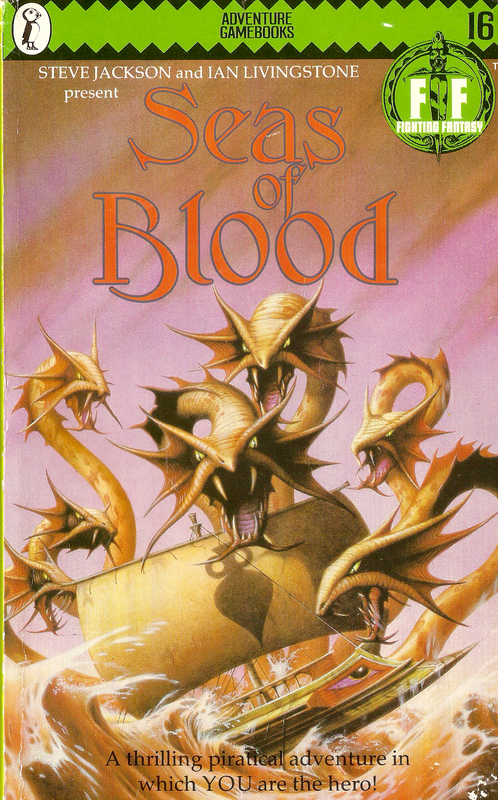 Cover artist Rodney Matthews has worked on a lot of rock album covers over the years, Rick Wakeman, Diamond Head and loads of awesome sounding prog bands I’ve never heard of all show up on his Wikipedia, but he was slightly misled when creating this cover. You Are the Hero tells us that a mix-up with a Junior Editor over his creative briefing led to an unintentional Arabian feel to his work, but he remains proud of his involvement. 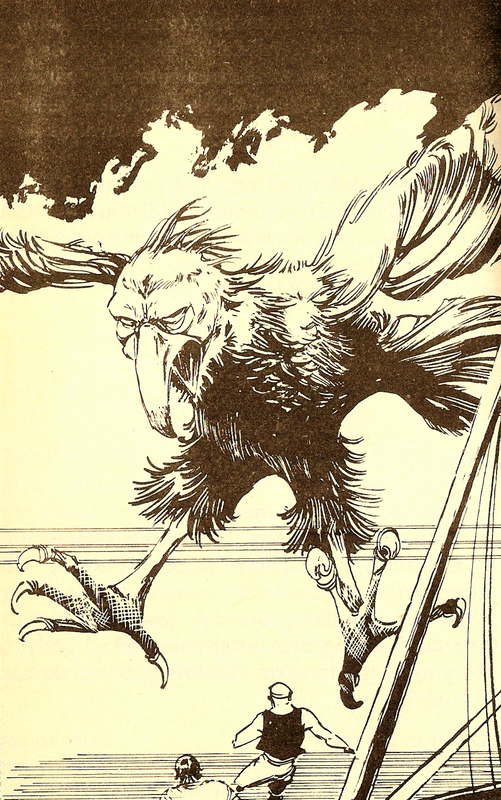 Rodney has done a lot of great fantasy work, including some Lord of the Rings stuff, so he’s well worth a Google. 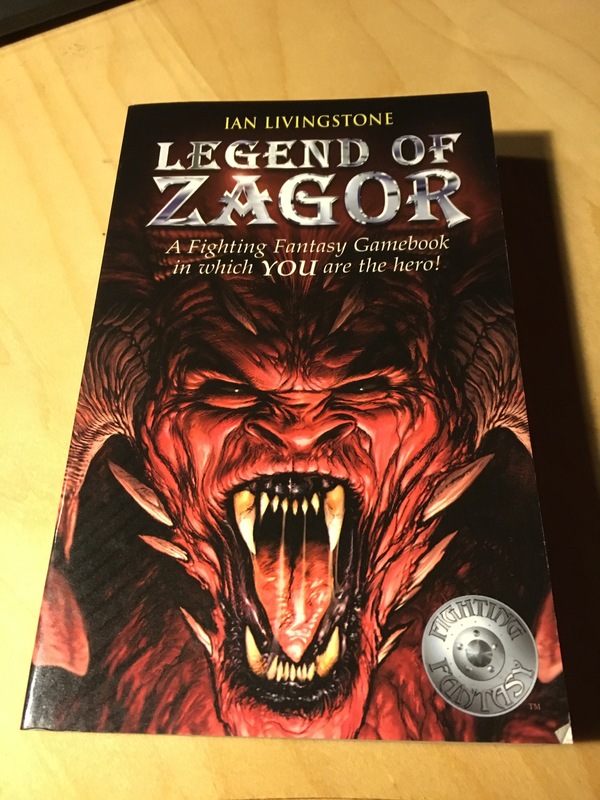 My memory brings two things about the book, one is that of its ship and crew orientated combat system and also having just been bought a copy as a child, impatiently having to try on new shoes in Keighley instead of getting to go home and start throwing dice around. What I don’t remember is if I actually liked the thing or not, the Review Archive throws up a mixed bunch, but seems to contain people throwing praise at Rings of Kether, so we won’t speak of that place again today. 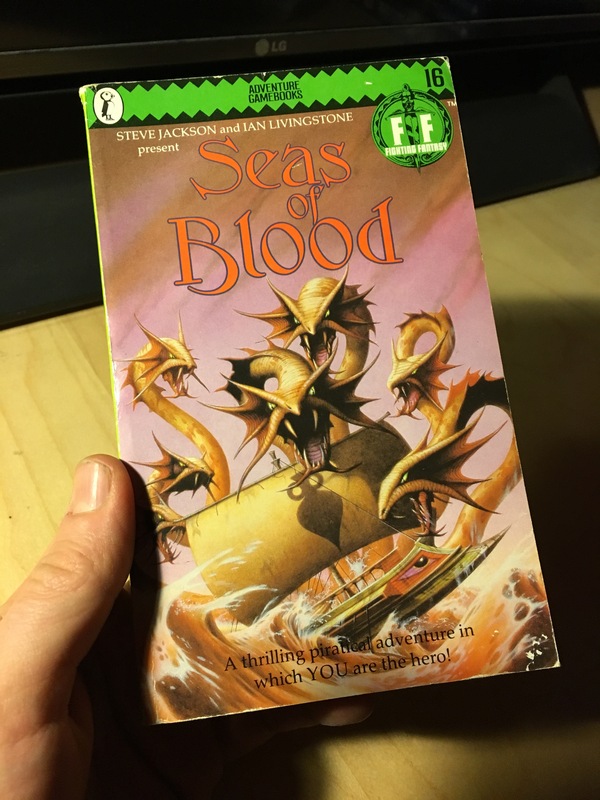 What I certainly don’t remember is the Spectrum version of Seas of Blood, which is a text-based adventure I’ve just managed to find footage of on YouTube. It doesn’t look good. Story-wise, things are similarly thin. We are playing as one nasty dude, we are a villainous pirate and we reside in the city of Tak at the northern end of the Inland Sea. Quite the tough guy, we are matched by only one other, Abdul the Butcher, a rival pirate who has agreed to a wager. The two of us will set sail for Nippur, each in a single ship and whoever accumulates enough gold and booty within a 50-day journey will be named the King of Pirates. No damsels, no big-evil, just bragging rights and a chance to play the bad guy. While simple, it does however make me itch to see exactly what I’ll find out there on the Inland Sea. My memory of a specialised ruleset for the book was slightly correct, there are a few new things to remember. There is a large-scale battle system in place, but one which simply replaces Skill and Stamina for Crew Strike and Crew Strength. Our 50-day spree of plundering is to be tracked in a Log, so the time-limit is something to consider it seems, but a positive side-effect is that 1 Stamina is restored for every day added to the Log. Other than that, it’s business as usual, so knowing Andrew Chapman we’re about to spend 50 days sailing down a long, straight corridor. Good luck Abdul, you’ll certainly need it! Yarr! Before we crack on with the next book, there’s a few finds I should update the blog with. Twitter followers will have seen a few of these already I believe, but I’ve managed to get four separate additions to my collection. Oxfam Books continues to be a rich vein and has given me three books across two different finds. 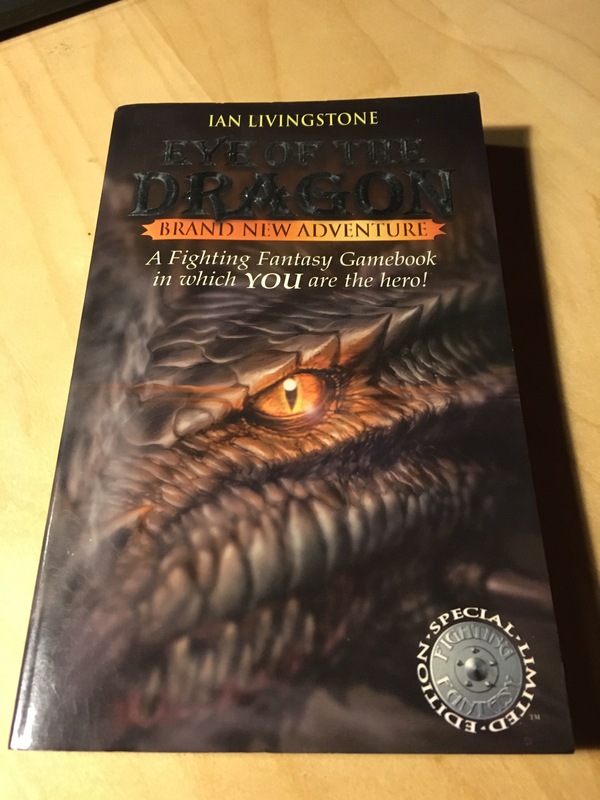 One was a gift aid book in the form of Eye of the Dragon. 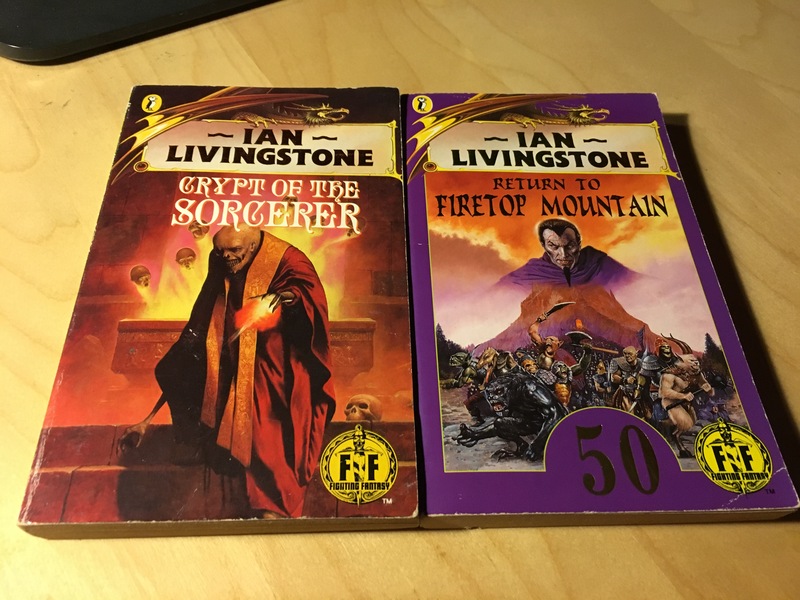 Oxfam again came through with a more diverse and exciting show of green-spines, several of which I already had in my collection, but there were gaps to be filled by Crypt of the Sorcerer and Return to Firetop Mountain. 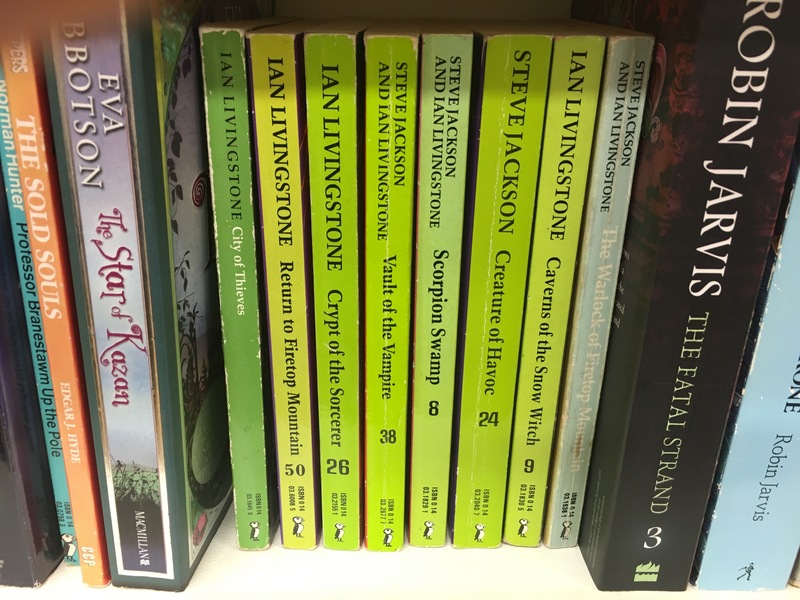 And most recently this weekend, surprisingly, a random wandering through Poundland to buy a cheap pair of pliers and a lightbulb resulted in the unexpected sight of Mr. Ian Livingstone’s name! 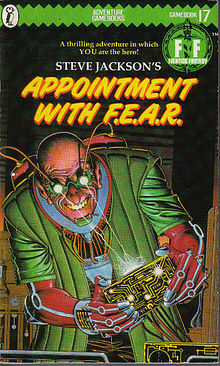 Oh how I long to read some books written by that man! Anyway, like I said, Seas of Blood coming soon… although I do need to get Pillars of Eternity finished before Dark Souls 3 appears so do bear with me!